I never played the original Cel Damage for the Gamecube, PS2 and Xbox. Playing a few rounds in the HD remake of the game, I could tell that this game felt like it was released ten years ago. The asking price of $10.00 could help ease anyone’s mind, and the fact that this is cross-buy for PS4, Vita and PS3 is a huge plus. The scene is set, quite literally, as the opening trailer begins. 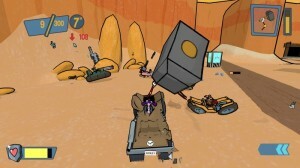 The game takes place in a fictional cartoon series that pits each character against each other in an effort to win the show. One of the few highlights of the game is the cel-shaded style. The game does a great job with catching the cartoonvibe, but what the game is lacking is any memorable character. The HD really makes the animations shine and the color is quite bright. Much like how animated movies look so much better in HD, the developers really knew what they were doing because the game looks like it was taken straight from the animator's art books. The six characters that are available do vary, from a simple rough and tough guy, B.T. Bruno, which drives a tractor to a kooky minion inspired character, Sinder, which drives a car with horns. In addition to these characters there are the four unlockable ones; a bull, dinasour, brain and a vampire. The gameplay for each character really does not change much other than big, slow car or smaller, faster one. I was unable to unlock any of the bosses, but they do appear in their respective arena. The lack of variety between characters really hurts the game, and could have really been helped by giving you these unlockable ones from the starting line. Each car also comes equipped with a primary attack, which was as good as any power-up you received during a round if playing on easy. The strength of your weapon does drop dramatically when you switch to normal or hard. The game unfolds like a competition, and after you win three rounds with a given character you are rewarded with a short clip of some zany antics. The tractor guy, for example, sings and tries to entertain the judges, until he busts through the wall Kool-Aid man style. If you are able to grind through 12 rounds with one character, which is a test of patience rather than skill, you are given a final video of that particular character, which is similar to the other clip. The only one I had the pleasure of watching was the minion’s. Much like the other clips you receive after three rounds, the scene unfolds with the minion doing some cartoon explosion on the judges. Like I said before, no character is memorable and none are worth having a cartoon show made about them, which is probably why they are just running each other over. The scenes that unfold are a very nice touch, but having to go in and beat 12 rounds to get each one’s final clip feels much more like work rather than fun. Of course, you could pick these final scenes up if you play enough local-play with friends, but I think you will only have patience for the clips after three wins. You are able to go back and see any previous scene with the ‘Reward’ section on the main menu. When it comes to the arenas that you play in, again the game falls short of what they could have done. There are four types; jungle, space, dessert and spooky and each type has four tracks for a total of 12 arenas. Although the types do differ widely, the multiple arenas under each one are very similar and feel like the same track over and over. I will give the game kudos in adding arena gimmicks, which can change the whole tide of the game. The gimmicks range from a tornado or anvil in the dessert levels, to alligators and fungus in the swamp arenas. Sometimes the gimmicks can get in the way, but I would much rather have them because they do give a level of depth in an otherwise very shallow game. What really lets this game down is the inconsistency of the controls and AI. There are three different modes; Smack, which sees you and the other opponents duke it out to see who can hit the most; Rally, in which you have to gather the most flags throughout the round; and finally Gate, which is the race segment. All modes take place in the exact same arenas, which makes this game feel repetitive and really hampers the Gate mode. I found myself driving past gates and getting knocked to the side before going through some. Because you do have to go through a gate before you enter the next, I found myself doubling back so often that I could hardly win a game unless I ran a perfect race. I played on easy and would be winning the entire race only to make one small mistake and be in last place. The other modes work very well in the confines of the smaller arenas. In each arena, you will constantly find a problem with the layout. You can fall off too easy. You could run into traps over and over. You could even find yourself floating in the air for a number of seconds until you respawn. The inconsistency of the controls is one thing, but when the level is so broken that you lose is really a turn off to any game. Another huge let down is the exclusion of online play. This game is very repetitive to play with yourself, and having friends to play with is a must. I was able to try out the local-play, and it was a very fun time. Although we could only bare four or five rounds, I can say we DID have fun with the time we spent with it. I only wish they could have had the resources to add online, even if it was for leader boards. The game is cross-buy and I did play a little bit on the Vita as well. The lack of any multiplier mode is a huge deterrent to play this game on the handheld. The visual quality is on par with any of the other version, if not better because of the smaller screen size. The controls are solid and overall, the game is as good as playing by yourself on the console. The problem is you do not want to play extended periods by yourself with this game. Not only is the game a drag, but it also does not support cross-save. This exclusion would not be a huge deal if it was not for the button layout for Remote play. I thought this would be another great addition, but again the game falls short. The throttle and reverse are mapped to the rear touchpad. You had to perfectly place your fingers to get going and even at that point there were so many troubles with stopping and reversing that I reached for my Dualshock 4 to save my sanity. I guess getting another game should be a very pleasant reward itself, but the lack of polish really hurts the addition of any Vita specific additions. As I was playing the game, I tried not to get too focused on the shortcomings and let downs. But from the lack of variety in character and arenas to the unpredictable controls, I kept being reminded that it felt incomplete. For a game that came out more than ten years ago, the only reason I can see anyone wanting to buy it is the visual upgrade. The concept of cartoon characters battling it out in their world and people watching on T.V. is a great idea. The inclusions of wacky scenes are funny and rewarding, and by far the best part is the cel-shaded art design. The game falls short in a number of areas that makes it unapproachable, especially in 2014. No character differentiation, the lack of arenas, the frustrating gameplay, inconsistency of AI and the unheard of lack of online for a car game makes this game feel incomplete. After about three hours you may never pick this game up again, unless you have a game night with friends.